After a driver has been arrested on suspicion of driving under the influence in Los Angeles, he or she will be given the option of completing either a breath or blood test designed to measure the driver’s blood alcohol content. Law enforcement officers may prefer that drivers take the breath test for a number of reasons. All police stations have a Breathalyzer machine on premises and they are relatively easy to operate. These machines will also provide an immediate result. In contrast, the blood test must be conducted at a hospital or other facility by qualified medical personnel, which often involves transporting the suspect to another location and waiting with him or her while the test is conducted. The results must be sent to the crime lab and the results of the test are not known for several weeks. Many DUI cases involve BAC results obtained on a Breathalyzer machine. These machines are not infallible and there may be ways to challenge the validity of the Breathalyzer test results. One of the key problems with most Breathalyzer machines is that they fail to specifically identify ethanol (also known as ethyl alcohol) from other similar chemical compounds. Studies of Breathalyzers have shown that these machines may detect other chemical compounds and falsely recognize them as ethanol. This could result in a person with little or no ethanol in his or her body testing on a Breathalyzer and yielding a high BAC result. Breathalyzer machines function through the use of infrared breath analyzing technology. An inherent problem with this technology is that the infrared is not designed to measure for ethanol specifically, but rather only a part of the ethanol molecule that is known as the methyl group. The methyl group compound absorbs the infrared light and provides the numeric BAC reading. There are a number of compounds besides ethanol that also contain the methyl group. These include acetone, acetaldehyde, propane, butane, methane and many other chemical compounds. Studies have shown that over 100 chemical compounds are detectable on the human breath at any given time and between 70 and 80 percent of these compounds contain methyl groups, including acetone and acetaldehyde. 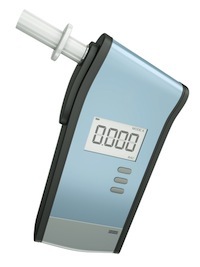 Breathalyzer machines function by detecting alcohol through additive absorption. This means that the more methyl groups that a person has in his or her breath sample that absorb infrared light, the higher the result BAC reading will be. If a person has several non-alcohol based methyl compounds in his or her breath, these will have a cumulative effect and will increase the BAC result provided by a Breathalyzer test. There are certain conditions that can elevate Breathalyzer test results. People who may experience higher BAC results due to the presence of other methyl groups includes those who have diabetes that have not been treated, people on certain dietary plans, people who are fasting, chronic smokers (who tend to have higher levels of acetaldehyde in their lungs), alcoholics, someone who has inhaled paint, glue or lacquer fumes, someone who has accidentally swallowed gasoline or someone eating various bread products. People with diabetes may be especially prone to high BAC readings. Research has shown that certain ketones exist in an untreated diabetic’s breath that can lead to elevated BAC readings. In addition, untreated diabetics may have acetone on their breath which can result in a perceived odor of alcohol. Diabetes can also lead to behavior that can be confused for intoxication when blood-sugar levels are low, including lack of coordination and balance, slurred speech, confusion and impaired motor skills. High acetone levels have also been discovered in people who are dieting. This can lead to the problems described above and can result in abnormally high BAC readings when tested on a Breathalyzer device. If you have been arrested for driving under the influence and you took a Breathalyzer test, it is crucial that you discuss your case with a Los Angeles DUI Lawyer as soon as possible. Los Angeles DUI Lawyer Michael Kraut is a former Deputy District Attorney with over 14 years of prosecutorial experience who understands how to effectively challenge breath tests results in court and with the DMV. Mr. Kraut works with highly respected experts to ensure his clients have access to the most thorough DUI defense possible. For more information about Los Angeles Breathalyzer tests, and to schedule your free consultation, contact Los Angeles DUI Attorney Michael Kraut at the Kraut Law Group located at 6255 Sunset Boulevard, Suite 1480, Los Angeles, CA 90028. Mr. Kraut can be reached 24/7 at 888-334-6344 or 323-464-6453.